Shaina NC might be great at tying a sari but as a designer she surely dissapoints big time! 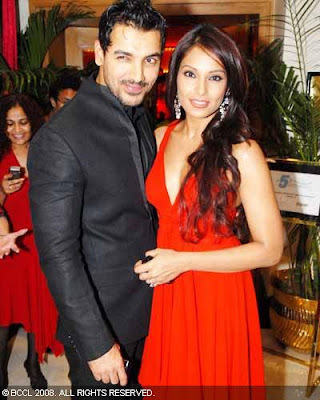 Just take a look at Sonali wearing one of the sari’s from Shaina’s new collection. As it is there is the overwhelming effect of the fake pearls on the sari but the overdose of the blingy ruby necklace just makes this whole ensemble so ugly! Shobha De’s collection seems to be even more appealing after taking a look at this! We know has it in white too, seems like the black is more of his favorite! 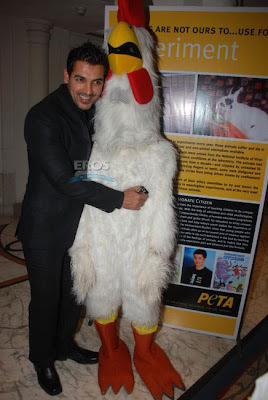 How come he looks much happier posing with the “chicken” than Bipasha!? Esha is probably trying to shake off that good girl image she has been garnering. 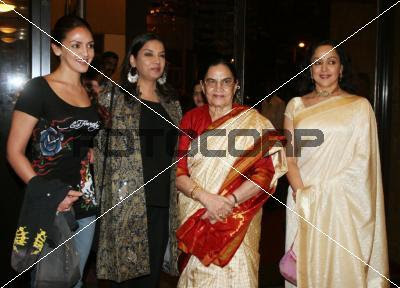 At the ‘Phir Wahi Sham Betiyon Ke Nam’ hosted by FICCI (FLO) Ladies organization at NCPA, she showed up wearing an Ed Hardy T with boot cut denims. Alas, this look is still not helping her cause. The whole look is so mismatched. The bootcut denim screams formal but also is too short. The Ed Hardy T’s low round neckline is too casual. The hair is having its own identity crisis! The girl’s just totally missed the mark. On an aside, if I showed up at a formal event dressed like that, my “Ma” would have given me an earful! LOL! John Abraham liked his jacket enough to get it in black and white!! Do you do that too, like something enough to get it in a couple of colors?